Over 300 delegates across different sectors of the Indonesian government attended the Indonesia OpenGov Leadership Forum 2017 held at Shangrila Hotel Jakarta on March 22. OpenGov Asia Editor-in-chief, Mr. Mohit Sagar, kicked off the day with a call to the floor to embrace innovation as a state of mind, to rethink about thinking on how things were done and ultimately to start believing in change in order to create change within government. The opening keynote speech by Mr. Sebastian Foo, eGovernment Advisor & Senior Consultant, The World Bank focused on creating value for businesses and citizens – in order for integrated services to happen, governments need to understand their needs, talk to them and understand their pain points. Another important factor is identify key outcomes to work towards, such as making application forms which are shorter and easier to understand. Mr. Foo (above photo) emphasised while factors such as having a central agency, a good plan that is actionable, sufficient funding and strong political are important in working towards creating good integrated government services, the key factor is still heartware- taking time and effort to understand citizens and businesses and creating humanised services. In the end, less is more and less is smart. Invited government speaker, Mr. Richard Vines, Knowledge Management Specialist, Department of Economic Development, Jobs, Transport and Resources (DEDJTR), Victoria State Government, spoke about smart collaboration in the context of building a knowledge-based service culture in the Victorian Public Sector. Examples in the farming industry were cited , such as working in agile ways to leverage data outputs to improve dairy feed inventory management and personalised information services steps for navigating types of permits for agriculture use. Mr. Vines (above photo) summed up by saying that a pressing challenge is the need to address the gap in developing data and informatics capabilities and skills of people for the future of the economy. For government, the challenge is integrating records management to data management and it is critical in skilling the next generation to be able to pass on knowledge both within and across countries. 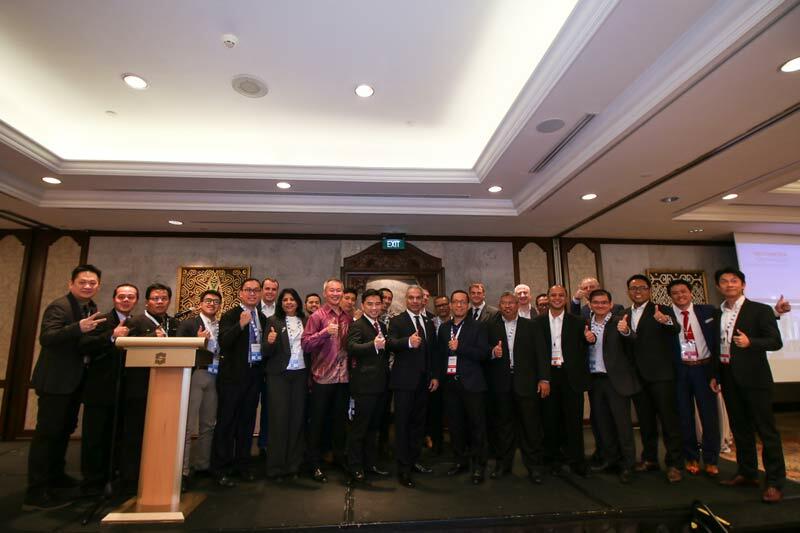 OpenGov also conducted the Recognition of Excellence (RoE) Awards Ceremony (below photo) at the event to recognise the progress and hard work of the Mayors of 5 Indonesian cities: Bandung, Bekasi, Bogor, Makassar and Tangerang. The Mayors individually received the awards in person from Mr. Sagar and individually gave a thank you speech, promising to do even better for their respective cities. Above photo (from left): Mayor Arief Rachadiono Wismansyah (City of Tangerang) Mayor Bima Arya Sugiarto (City of Bogor), Mayor Ridwan Kamil (City of Bandung), Mr. Mohit Sagar, Group MD & Editor In Chief, OpenGov Asia, Vice Mayor H. Ahmad Syaikhu (City of Bekasi) and Mayor Ir. H. Mohammad Ramdhan Pomanto (City of Makassar). A series of panel discussions and subject-matter expert talks followed after lunch with the first focusing on The Next Generation Data Centre. Mr. Sagar started the panel saying that the management of data centres are challenging as most government departments/agencies usually want to hold on to their data. When asked on their thoughts on how the future of data centres will be like, Mr. Djunardi said that data centres will be built in collaboration aross departments, Mr. Vines replied that data centres will be of mixed government use and Dr. Jumaan explained that data centres will be ‘green’ and there will be cloud deployment. A question frrom the floor was asked on whether cloud or on-premise data centres would be preferrable – Mr. Djuniardi replied that due to limited budgets, it is difficult to have on-premise full-capacity data centres, so going onto cloud is one of the options. Another delegate asked about an overview on some of the best practices for the next generation data centres and Mr. Vines responded that a legal foundation needs to be bulit by the government on the ownership of data and under which circumstances it can be shared. Mr. Bala explained consolidation as a best practice with an example of a government agency which reduced 43 data centres to just 4 through an assessment service while at the same time, increasing capacity and reducing power usage and space. Finally, Dr. Jumaan shared from his own experience in Sabah that ministries and departments used to have their own data centres while operations is still doing the same thing. A new ruling was set that no government would have their own data centres but consolidate it to the state data centre. As a result, individual ministries and departments did not have to worry about their own data centres and the Ministry of Finance can monitor costs easier. Moving on to a presentation about the local Indonesian context, Mr. Eddi Danusaputro, CEO of Mandiri Capital Indonesia, talked about the fintech startup scene in Indonesia. Mandiri Capital Indonesia is the venture capital (VC) arm of Bank Mandiri, the 12th and youngest subsidary. Mandiri’s Capital mandate is to invest in digital startups in Southeast Asia and only in the area of fintech. Mr. Danusaputro (above photo) mentioned that fintech is a growing sector, and there are many active VC players in Indonesia. Additionally, there are no successful IPO of startups based in Indonesia as the regulations and requirements are very stringent – he lamented that there are many Indonesian startups listed overseas in places such as Singapore or Australia but not within Indonesia. The areas of payments, lending and enterprise solutions are the 3 areas in which Mandiri thinks are growing but investments will only be made if there’s agreement from other business units within the bank. Mandiri Capital has currently invested in 7 Indonesia-centric startups in their portfolio, out of the original 95 proposals that were presented. The panel began with each of the panelists sharing about the cybersecurity approach in their respective organisations – Mr. Glen said that at DBS, it is to provide safe e-channels for customers and teaching them to be aware of cyber risks and threats. Lt. Sukardi explained that Cyber Security Malaysia’s role is to support the government to achieve the national agenda of moving to the digital economy, which is a complex combination of different technologies and various risks that come with it. The only way to manage the risks is to understand the issues related to the risks and threats- risks cannot be completely eliminated, they can only be managed. Mr. Siregar responded that it was about both educating employees and customers. The panel agreed that mor often than not, it is about managing the weakest link, which is the human factor and unsurprisingly, Mr. Siregar also mentioned that more than 60% of the threats come from inside. In his own organisation, Mr. Siregar said that internal phishing emails were simulated to test employees. For the customers themselves, the digital banking/products are consumed by millennials, which are described as “Generation Leaky”, leaking out things for the sake of faster speeds and connections, compromising security. The final subject matter expert talk was given by Mr. Stuart Smith (below photo), Chief of Service Innovation and Design, Institute of Systems Science, National University of Singapore on the topic of Digital Transformation in Government: How does Desing & Innovation Fit in. There are 3 pillars of “digital”: a good human-centred digital service is an intersection of service design, data and technology. Design is core to the success of digital government – which is why governments need to understand citizen journeys – knowing citizens’ needs and pain points, ultimately to design services they want to use. It is therefore crucial to design the service first then work on the technology part of it. Summing up, Mr. Smith reminded the floor that people always remember feeling good (and bad) about experiences and services, thus it is critical to make services a memorable and relevant experience. The moderator began with what the definition of digitalisation of government services really mean for the respective panelists. Mr. Setiaji said it was about improving government services, Mr. Dornier replied that it was moving from a physical place of transactions to a digital one and Mr. Ng said that it was the concept of service as primary, how to make citizens feel that they are being served by the digital economy and enjoy the services. For Ms. Raj, digitalisation of government services is about providing services 24/7, looking at the pain point of the citizens, what citizens want and how do they want to interact with the government. Mr. Samadhi simply said that in the context of Indonesia, there is a need for transparency for the digitalisation of government services. Mr. Sagar posed a final question about why government agencies are not talking to each other to provide better services to citizens, which was rejected by the panelists – Ms. Raj said that the notion is the past as government agencies are increasingly working with each other, and Mr. Nirata explained that the government is using the One Map Movement in Indonesia to come up with one data, one standardised system to regulate business operations so agencies can share the data but it is a journey that is going to take a long time.